Milt Kahl is showing some guests the scene he is working on for The Jungle Book. 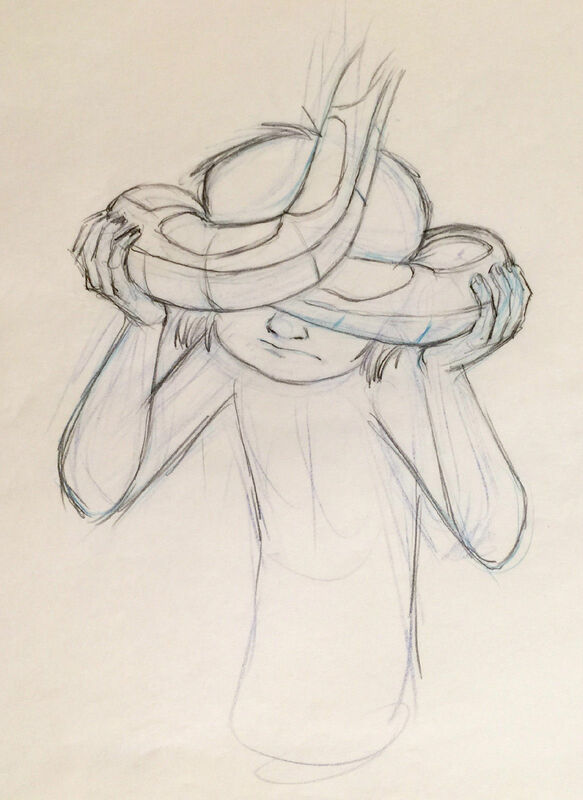 Kaa, the python, has a strangle hold on Mowgli and is about to devour him. Luckily Bagheera, the panther, interrupts the situation just in time. Kaa is a fascinating character. I will never be able to figure out how Walt Disney thought that the voice of Winnie the Pooh would be perfect for a villainous snake as well. I suppose actor Sterling Holloway was able to slip into just about any role and be convincing. 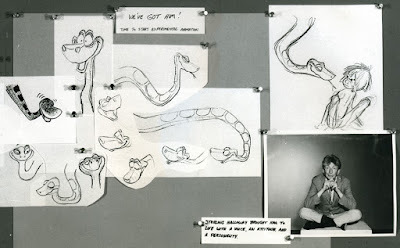 What's also interesting about Kaa is the fact that the snake's design changed. In this early sequence the eyes are smaller and are drawn streamlined on top of the head. 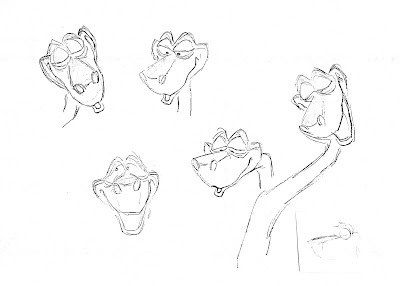 When Kaa returns later on in the movie, the snout is larger, and so are the eyes. These are Milt's drawings as well. Unfortunately I never thought of asking him about the subtle change in design . 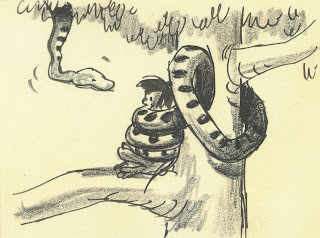 Going back, here is the starting point in terms of design, a story sketch by Bill Peet. 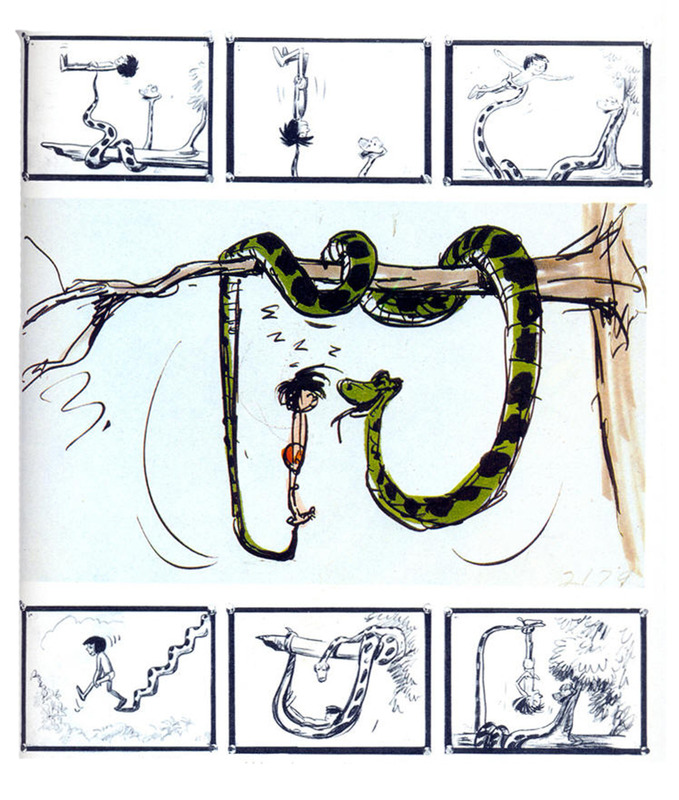 According to Frank and Ollie's book The Illusion of Life several artists contributed to the visual development of the snake. I recognize Ken Anderson and Milt at the very end. 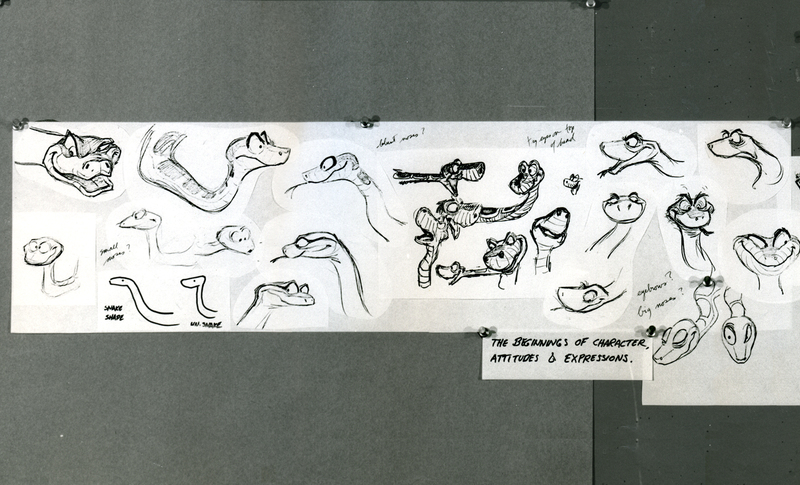 More of Milt's drawings. What a great rough sketch with Kaa and Mowgli. Frank Thomas animated the later sequence, when Kaa tries again to hypnotize Mowgli in hopes for a meal. 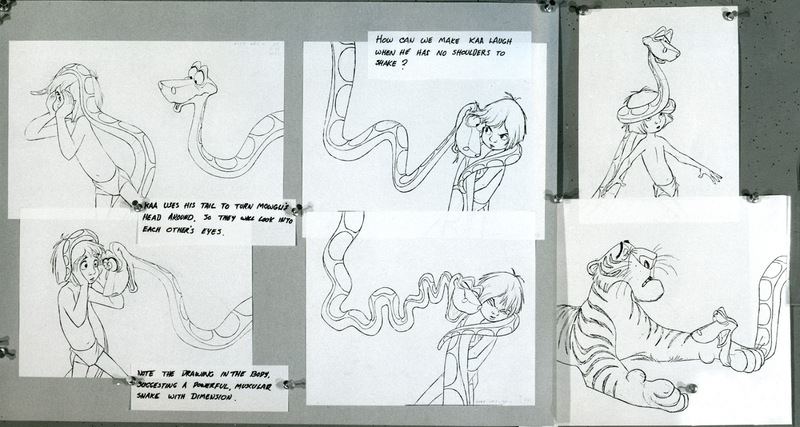 Shere Khan interrogating the snake is of course Milt's sequence. Story sketches by Vance Gerry with the help of Floyd Norman, a new and upcoming story artist. 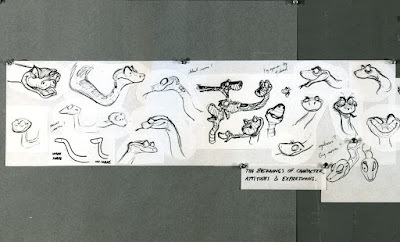 The central color sketch is by Ken Anderson. 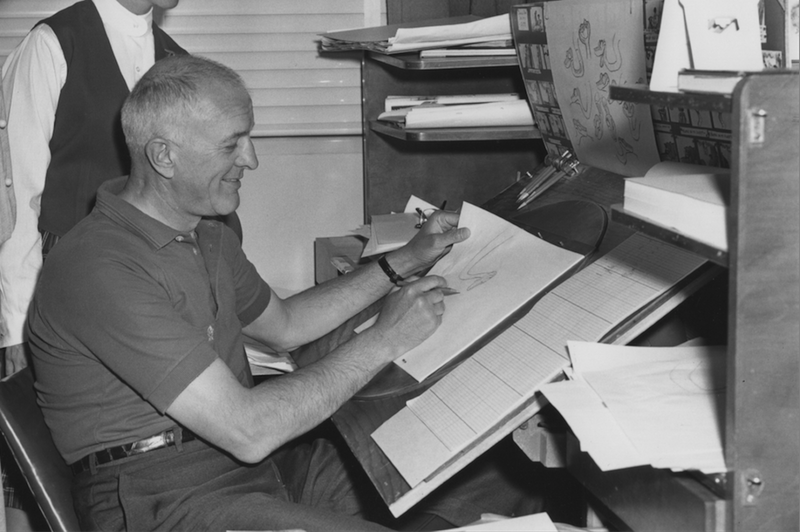 A Frank Thomas rough animation drawing. 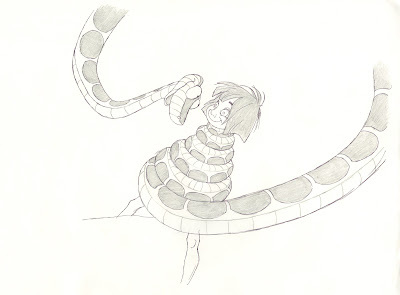 Mowgli tries to free himself from Kaa's body. 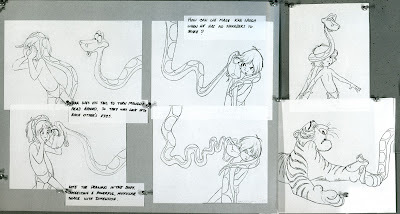 As all characters in The Jungle Book, their acting and relationships to other personalities is what makes the film. So little story, but sooo many entertaining situations. Still my favorite.